The New York Times drives Interstate 80. That’s Carlin in the distance, railroad tracks on both sides of the Humboldt River. Entering Palisade in the good old way. around the shoulder of a hill and across the river on the broad new bridge and you’re at the outskirt (an upside down school bus in a bed of dried mud) of Palisade. The trains of two railroads come crashing through here day and night, engines roaring, horns blaring. 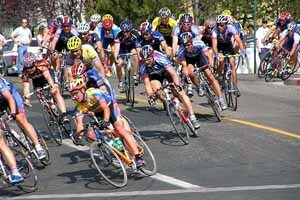 June 16-18 in Reno the Tour de Nez (“coolest bike race in the world”) will offer $35,000 in prize money and showcase events for all forms of cycling. This little guy was hanging out with his mom about a mile above Palisade. 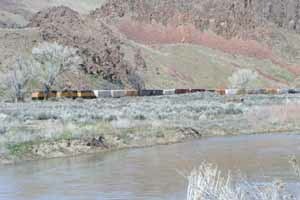 the river’s bank that suggest Palisade’s busy and hardscrabble past. There are two roads out of Palisade besides the one to Carlin. 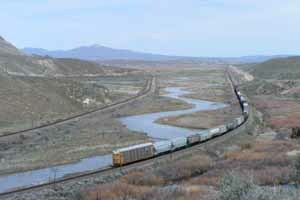 One follows the course of the river and the railroad about 18 miles west to Beowawe, where the pavement resumes. I took the other one, which climbs steeply north and proceeds across the grain of the country, eventually arriving at freeway offramp 271. In the process I schmoozed my way through a semi-friendly herd of white cows with their calves who thought they owned the place. It’s steep in places, but basically an easy drive on a well-graded road through beautiful landscapes, perfectly fine for the family sedan. We made another visit to Mesquite. We like its laid-back version of get-up-and-go. 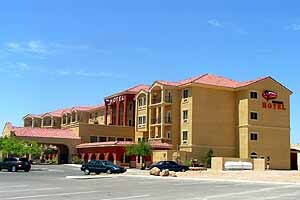 The Falcon Ridge is Mesquite’s newest hotel — and it’s casino-free. Honeymoon Packages are the specialties of the house, but with a desk, a microwave and a refrigerator, we can settle in and work comfortably while we’re on the road (the petite suite is perfect for us), the staff is helpful and there’s a free hot breakfast buffet too — what’s not to like? Another fortuitous find: the Panda Garden at 10 W. Mesquite Blvd. makes possibly the Best Cosmopolitan in Nevada (Professional Division); the search continues, nominations are invited. 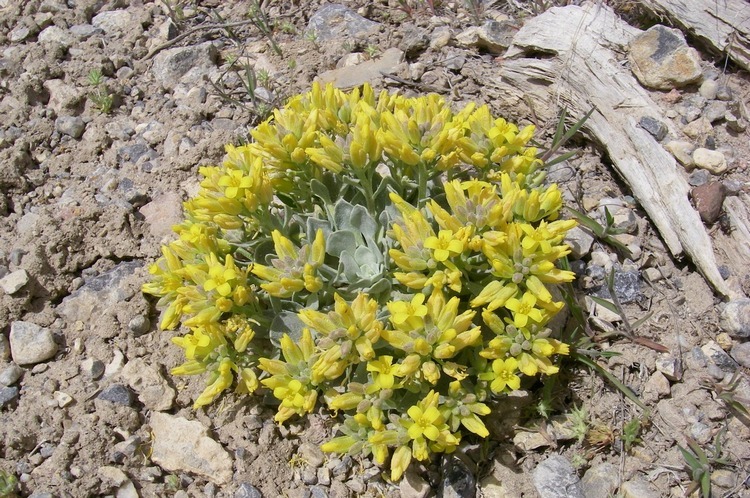 Brief notes from beyond the mountains: Here is a website devoted to Nevada Wildflowers in this lush and lavish year . 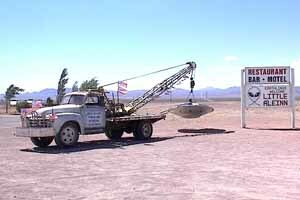 . .
For the next 26 years Harry Gorham worked with his uncle Sam managing the Crown Point and other mining and milling properties belonging to Sam’s brother John P. Jones, one of Nevada’s Silver Senators. While John was developing Santa Monica, California, building a railroad and cutting a swath through Washington, Sam and Harry managed and operated the Comstock mines and mills. Special Pre-Publication Price:Paperback $20 post-paid. Add Squaw Tom Speaks for $15. 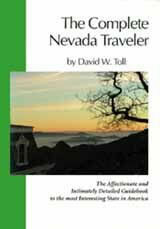 Add The Complete Nevada Traveler for $15. 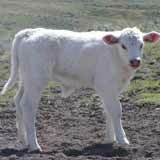 From 1877 to 1903 his privileged position gave him access to all levels of Comstock life above and below ground. He knew everyone, and accumulated a treasure trove of stories. 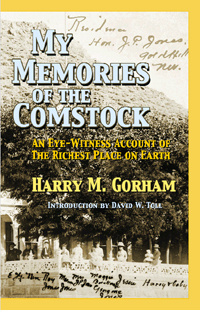 This book is a monument to his times, and to the life that flourished on the Comstock Lode in the later years of the 19th century. Originally published in 1939 and long out of print, this exceptional book has a new introduction by David W. Toll, the author’s great-grandson, with photographs from the Gorham family album. Paperback and hardback editions in bookstores soon at $21.95 and $39.95. Tonopah’s Mizpah Hotel has been sold, for real this time. The sale is to a Las Vegas partnership which plans to restore the Mizpah to something like the elegance it enjoyed after its first restoration in 1979 . . . One of the partners has also purchased the Belvada Building across the street. Together with the Mizpah, the “Belvada Hilton” establishes Tonopah’s urban skyline, but it’s in poor repair and will require considerable work before it reopens to the public. Originally an office building, with glass doors and transomes above them, it had been converted to apartments many decades back, with most of the original appointments still in place . . . Beatty‘s business establishment is in for major changes as both the Exchange Club and the Burro Inn have been sold to a single new owner . . .McAvoy Lane and Remmel Wilson, who premiered Nevada’s Story at Comma Coffee last month, are now presenting their two-man multi-media production as a weekly Dinner Show on Tuesday evenings from 6-8pm at the Zephyr Cove Melody Tent at Lake Tahoe. Tickets are $49; for reservations phone 800-23TAHOE. When I attended the premiere of this laughable show (I mean everybody was laughing), I expected Baron Von Remmel to be a foil, a sort of second banana to The Ghost of Mark Twain, who wrote and narrates the story, and has all the best lines. It turns out that Wilson can play the saxophone for real. His musicianship is a major part of the enjoyment, and the enjoyment is considerable . 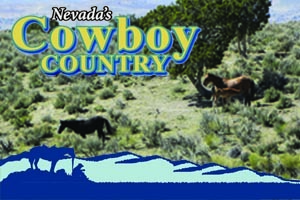 . . Street Theater: The Virginia City Convention & Tourism Authority (775-847-0311) is calling for volunteers to dress up in historical clothing to showcase the colorful and exciting history of Virginia City by chatting up the tourists and answering their questions.